Fehler in abs_path(output_file) : The file 'mydoc.pdf' does not exist. LaTeX Warning: Command \texteuro invalid in math mode on input line 281. Could anyone help me with this? It'd be much appreciated! tinytex:::install_prebuilt is an un-exported function of tinytex. I suggest trying tinytex::install_tinytex. Note, you might have to do tinytex::uninstall_tinytex first. 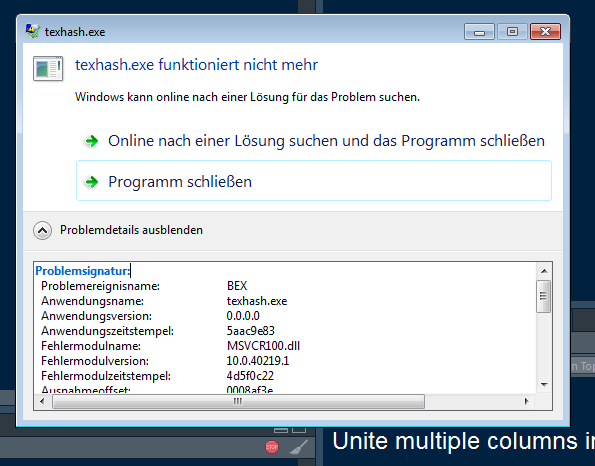 Thanks, but I'm using install_prebuilt precisely because install_tinytex doesn't work in my case. In my organisation, I cannot connect with the respective servers. I am assuming this is in a windows environment. Based on the source code for tinytex:::install_prebuilt, all it does is download a zip file and install. I think the installation as such is really not the problem here. Before changing the title and most of the text body of this topic, I'll rather delete it completely and start anew.